Reynard Loki of the Independent Media Institute speaks with author Leslie Crawford about her inspiration behind both Gwen and Sprig and the animal welfare message she wants to share with kids and parents. These are the brutal realities for millions of animals trapped on factory farms. But how do parents and teachers address these realities of our broken and inhumane food system with children? Journalist, editor and author Leslie Crawford has answered that call with two books published by Stone Pier Press, an environmental publishing house with a focus on food and sustainability. The first, Sprig the Rescue Pig, tells the story of a factory farm pig who escapes the truck bringing him to a slaughterhouse, before being rescued by a young girl and her family, who show him love and kindness. The second, Gwen the Rescue Hen, published this month, is about a chicken who escapes from an egg factory farm and is rescued by a young boy who decides to make her—and some of her fellow escapees—a part of his family. Both books include special sections filled with fascinating facts about pigs and chickens to help educate kids and adults about how incredible pigs and chickens really are. In telling these heartwarming tales of resilience, compassion and love, Crawford avoids the more brutal realities of factory farming, showing simply that these farms are extremely unhappy places for such intelligent and emotional beings. She focuses instead on how truly wonderful these overlooked and poorly treated animals are—that they're way more than just bacon and nuggets. After a tornado blows down the hen house, Gwen is reunited with her flock of friends, which now includes Mateo. 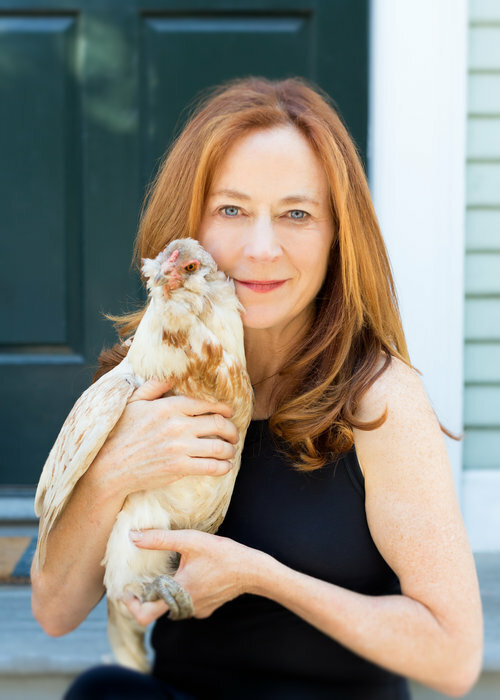 In this interview, Crawford discusses what inspired her to write these books, what messages she wanted to convey to kids and parents, and what it's like living with chickens (and pigeons and a bearded dragon). Leslie Crawford: From the age of four, she was a fierce defender of pigeons, chasing away the little kids who chased away the pigeons. A couple years ago, she asked if we could adopt rescue King pigeons since she had learned about the organization Palomacy, which saves racing, homing and King pigeons who can't survive in the wild. I have six chickens and so was already more bird-minded … [so] I impulsively said yes … I'm a pretty impulsive person, which is why we now have four pigeons who live in an aviary right outside of our kitchen. Sometimes they fly into the kitchen. Yes, it's weird. Gwen the Rescue Hen is your second book about farm animals published by Stone Pier Press, following Sprig the Rescue Pig. As you developed these books, did you find inspiration from other children's books? Absolutely. I also have a 21-year-old son, and so for years I’ve been reading children's books. It's a particular art—children's books—and not at all obvious to get the language right and tap into the mind of a child without being condescending or cutesy. My inspirations were Roald Dahl, E.B. White (who, of course, authored the ultimate pig book, Charlotte's Web), Margaret Wise Brown, Louis Sachar. My ideal children's book is honest and funny and a bit strange. I don't think Gwen or Sprig is strange, though. We were mostly trying to help children and their parents to really see these remarkable animals. I identified a superpower that each animal has. For pigs, I chose their extraordinary sense of smell and for chickens, their remarkable vision. Pigs smell better and more than we do—they can smell truffles three feet underground. Similarly, chickens have technicolor vision and are more alert to detail and movement than we are. These, of course, are survival techniques so they can find food (bugs!) and avoid danger. Fantastic. There are so many kids' books about animals, but not many about animals in which we are inviting the reader to really get a sense of what it's like to be a pig and to be a chicken. Animals at the mercy of a big industrialized system who are afraid and confused because they don't know our language—as I write about in Sprig—and are smart enough to figure out that something is very wrong. We got an especially warm reception from parents who are vegetarians and vegans because there are very few [children's] books about the plight of these animals. But the bonus section on cool things to know about pigs seems to captivate everyone. (We also include cool things about chickens in Gwen.) Most people have no idea how smart, affectionate and curious these animals are, and they seem to like finding out. As for Gwen, the early reviews are great. Of course I used my own flock of six hens as inspiration. What was the most surprising thing you've learned about pigs and chickens in writing these books? For pigs, how astonishingly smart they are. Their IQ, by some measures, is the same as or above a three-year-old child's and dogs. In fact, they are among the smartest animals, up there with chimpanzees and dolphins. With that intelligence comes a particular emotional intelligence that is evidenced by their curiosity and sensitivity. Like dogs, they like to be scratched. They cuddle, play fetch, come when called, have been taught to paint and play video games. As for chickens, I thought I knew everything, but I learned much more. They have remarkable eyesight and can see colors and detail that we can't. I learned that their earlobes (yes, they have them) indicate the color of their shells. They can add, subtract and recognize shapes. This is interesting since people think they are so stupid, but they have really good memories, especially for other chickens and the people they like. I learned even more what I already knew—that they are creatures with the wide range of feelings and perceptions that, while not all like humans, are remarkable in their own right and for that reason are worthy of our empathy and respect as fellow creatures on the planet. Have you found that there is a need for books about farm animals for children? How would kids normally learn about what's happening to animals on factory farms? Well, most people—adults and kids—don't know what is really happening on factory farms. As for teaching kids, it's a fine line because factory farming is such a brutal system. Just as learning about that is almost too much for most adults, it absolutely is way too much for kids. So we chose to teach more about the animals themselves, the rare few that get to leave that system and live a full life as a pig at a sanctuary or a chicken in a boy's backyard. My hope is that as people become even a little more aware about factory farming, they will see the damage factory farming is doing—to animals, yes, but also to the environment, the climate and our health. Once you start putting these pieces together, those can collectively become reasons to make more of us change the way we eat. This is a delicate subject. It's so horrifying, and no one wants to give their children nightmares. With our books, the goal is to inspire conversations about where our food comes from—not by using fear or guilt, but by drawing on our compassion. Author Leslie Crawford and Alice, one of her six backyard chickens. What would you tell parents who want to avoid purchasing meat produced in factory farms, or parents who are considering switching their families' diets to more plant-based eating? I'd tell them they are helping not only the planet but themselves and their children by encouraging them to eat more fruits, vegetables and grains. Factory farming heats up our planet, pollutes waterways and air, and eats up land used to grow the grain that feeds livestock—and lots of water too. It also hurts the people who live near and work at [the farms]. Even if a family isn't vegetarian or vegan, just reducing the amount of meat and dairy we eat can make a difference, and there are so many good plant-based options these days, with many more coming to market every week. For so many years [Americans] were focused on efficiency. Now more people are recognizing the dangers factory farming has created for our world. One result is the surge in support for clean meat technology and the development of more tasty plant-based alternatives. There's also a new and growing awareness of the difference eating less meat can make. Is there another book in the works for this series? What's next for you? We are focusing on getting Sprig and Gwen more out into the world. We've talked about other animals. We'll see. I have talked about McDow the Rescue Cow with Clare Ellis, the publisher of Stone Pier Press (who had the inspiration to do these children's books as a way to reach children and parents). But for now, we just want these two books to get into the hands of many happy families. Both Gwen and Sprig are available for purchase on Amazon, Chelsea Green, and in the Stone Pier Press bookstore. You can also ask for them at your own local bookstore. Both books are perfect gifts for animal lovers of all ages and can be the perfect way to introduce discussions about animal welfare. What are the most important takeaways you'd like kids and parents to get from Gwen the Rescue Hen and Sprig the Rescue Pig? Reynard Loki is a senior writing fellow and the editor and chief correspondent for Earth | Food | Life, a project of the Independent Media Institute. He was named one of FilterBuy's "Top 50 Health & Environmental Journalists to Follow" in 2016. His work has been published by Truthout, Salon, BillMoyers.com, EcoWatch and Truthdig, among others. 8 reasons to love chickens!